Tips and Techniques: DATERANGE function – How can we help you today? In this Tips and Techniques article, let’s discover one of our date and time functions, the DATERANGE function. The DATERAMGE function is a little different from the other date and time functions in that it is not necessary to reference a column or row of dates in a data source file. 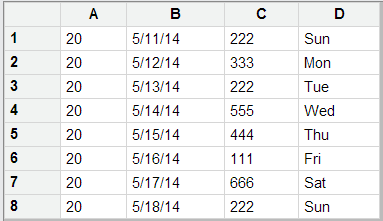 The DATERANGE function can create its own series of dates based on the formula you build. Our article on the DATE and DATEVALUE functions. How to express the date format you want to display. For example, dd/MM/yy-ww (day/month/year-week). In this formula, the DATE_STARTOF function specifies a start date of one week ago and the DATE_ENDOF function specifies an end date of today, returning week 20 of 2014. Tip: To check this, wrap the DATE_STARTOF function or the DATE_ENDOF function in the DATEVALUE function. Use the Redo change to formula button to remove the DATEVALUE function. Tip: You can easily reference the DATERANGE formula in a LOOKUP formula by using the Insert Reference to another component (REF) button on the formula bar. Let’s now look at our Support example. In this example, the DATERANGE function on the X:Axis is not using our data source file. The Series refers to the X: Axis formula, and also to column C in our data source file. The DATE_CONVERT function ensures that the date format for column B is in the same format as the date format of the X: Axis. Result: Returns days for week 20 of 2014. This Klip uses the following data source file. When building this Klip ensure you have data that contains dates for the last week of the current year.